This lovely Christening / Baptism gift is personalized with name, baptism date and (optional) Church name and Godparents' names. 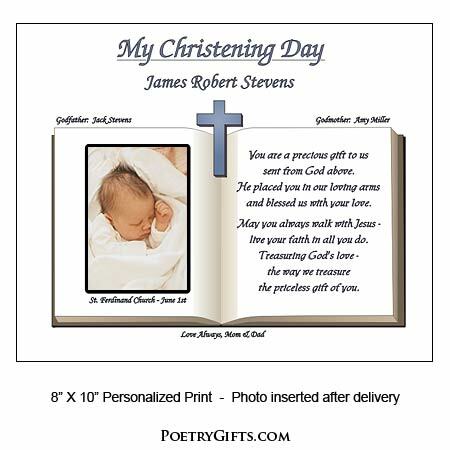 This unique Poetry Gift makes a treasured baby christening gift. Baptism is usually the first sacrament a newborn receives and so it is truly a special occasion for the baby and the family. 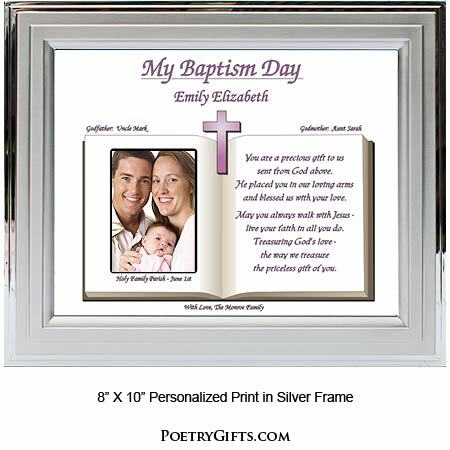 If you are looking for a Baptism or Christening gift to commemorate this important day, consider our EXCLUSIVE Poetry Gift design. It's a thoughtful baby present from Godparents, parents, or any family member. 9. 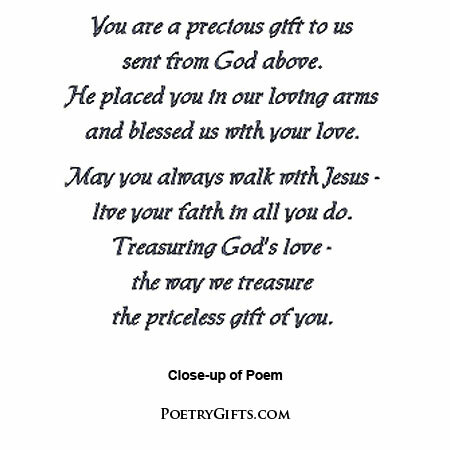 Closing Phrase and Your Name(s) (as seen after poem) - Examples: Love, Mom & Dad; With Love Aunt Amy; etc." This is a very nice keepsake. I previously purchased one for Confirmation. Both are very nice and the recipients loved them. Very nice quality. Thank you for your very nice and timely work! I received it today and it's everything I hoped it would be. Thank you!